Find how Fibre optic sensors work on this link. The FOH201 is a compact and portable fiber optic handheld meter to be used with Omega’s interferometric fiber optic sensors, for temperature, pressure, and strain measurements. At the heart of the FOH201 is the white light polarization interferometry (WLPI) technology which is patent pending. This technology provides a means for making accurate and absolute measurements of the path length difference of any type of interferometric fiber optic sensors. The difference varies according to the parameter of interest. The FOH201 is equipped with a large visible LCD display and can be battery operated. It comes with a standard ±5 V analog output and a RS232 communication port for realtime data acquisition. The FOH201 can be controlled directly using the front-panel keypad or remotely using the standard RS232 interface. A rugged casing with a removable rubber boot provides good mechanical protection against intensive handling in tough environments. 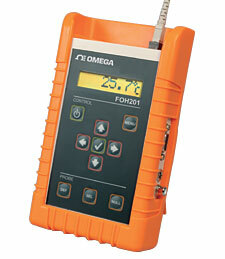 The FOH201 is compatible with all Omega WLPI sensors providing a multi-purpose tool for measuring various parameters. With a 20 Hz sampling rate, a ±0.003% full scale resolution, and a ±0.01% full scale precision, the FOH201 delivers the performance needed for a wide range of critical measurement applications. Nota: Comes with software, RS232C cable, AC adaptor, 9 V battery, temperature probe, strain probe, pressure probe, cleaning kit, and operator’s manual.